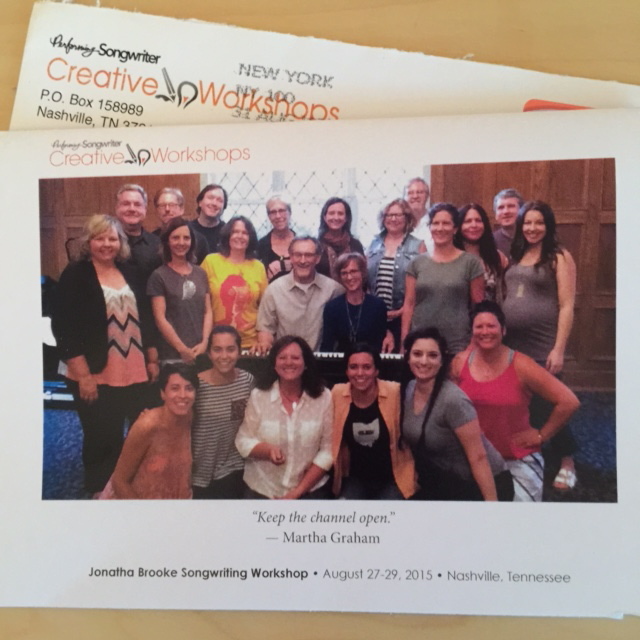 Ever since returning from the songwriting workshop I attended in Nashville a few weeks ago, I've shied away from writing about it. Maybe it feels too precious, and I don't want to mess it up with words. But words are kind of my thing. Stringing them together on a blog post, or in a song especially, is my favorite thing to do. A blank canvas, so to speak, can feel a little intimidating when you really want to capture something that feels so important. But once you make a few marks, and start digging in, you start to feel less afraid. That first step tho... Ug. With Jonatha Brooke! And Mike Reid! And Emily Saliers! Getting to hear Keb Mo! And Christopher Cross! It was almost too much for only 3 days. There wasn't one single minute I was bored. And I tend to have a very short attention span, so that's saying a lot. Not just being around the above mentioned artists. But getting to talk about songwriting for 3 days straight, after having put it on the back burner in my life for the last several years. And opportunities to step outside my box!-my little box that has gotten smaller and smaller lately. The day after I got back, my sister happened to be in town, and we met up so I could to tell her all about it. She was the perfect person to tell. Just talking about it made me cry, and I wasn't even sure why. But she told me, and I think she was right, it was just emotions bubbling up. Right up to the surface. As I was talking to her, all that emotion was really getting in the way. When I cry, my voice locks up. And although I wanted to express myself, I couldn't. And like most people do when they are crying, I kept apologizing. I wasn't crying because I was sad. Or even because I was happy. I was just full of emotion in the retelling of the meaningfulness of that weekend in Nashville that I SO needed. I'll be writing more (and more) here. My writing muscles (blog and songwriting) have gotten a little out of shape due to lack of use. But I'm currently in training... Please, please stay tuned. I Can't Feel My Face-- Now I Get It!